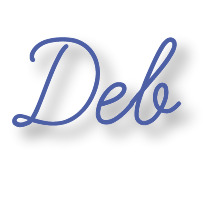 Next article: I’m Joining the Ultimate Blog Party! Wow! I have an ABSOLUTELY AMAZING Montessori materials giveaway to celebrate my first blogiversary on April 13! 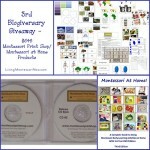 The giveaway is open from now until 11:59 p.m. MST Tuesday, April 12, with the winner announced on my blogiversary! 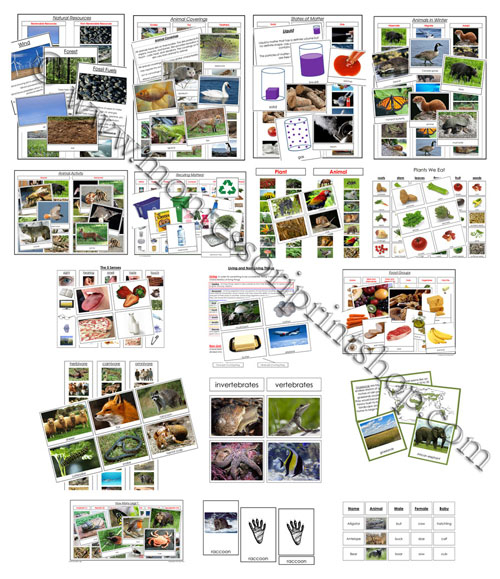 Montessori Print Shop, one of my favorite Montessori suppliers, has over 940 beautiful printable Montessori materials in digital file format. I’m extremely excited to be able to offer such a wonderful prize (all the Montessori Print Shop PDF files) for my giveaway!!! And the giveaway is open to my readers worldwide! Perfect for school or home use for children ages 18 months-early elementary! 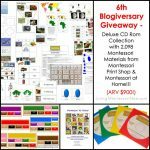 What You Will Win: Montessori Print Shop Deluxe CD Rom 2-Disc Collection – 944 Montessori Materials AND 4 Primary Teaching Manuals! Current Value: $580.25. If you were to purchase all of these files individually it would cost $2152.27! 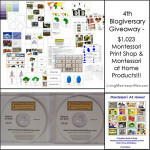 Montessori Print Shop will ship the product at no cost to the winner. Winner must provide Montessori Print Shop with full shipping address (including phone number). Winner will be contacted directly by e-mail for shipping address (address and phone number is kept confidential). Be sure to use an e-mail address through which you can be easily reached if you win. You can enter multiple times! Please make a separate comment below for each entry. For entries such as Twitter, Google Friend Connect, Facebook, etc., please tell which name you’re following as. You have many chances to win! This giveaway is open to anyone 18 and older worldwide. Leave a comment telling which country you’re from and why you would like to win. * Subscribe to Montessori Print Shop’s newsletter. * Subscribe to my newsletter (and get Montessori quotes plus geography album by Karen Tyler from Worldwide Montessori Online FREE when you sign up!) – see my sidebar. * “Like” Montessori Print Shop on Facebook. * “Like” Living Montessori Now on Facebook. * Follow @MontessoriPrint on Twitter. * Join our Living Montessori Now Community. * Blog about this giveaway, linking to the giveaway in your blog post (worth 3 additional entries – leave 3 separate comments with identifiers such as entry 1, entry 2, and entry 3 along with a link to your post). * (ONCE DAILY for extra entries), leave a comment telling a different Montessori Print Shop material you wish you could print out that day. Shared on my Facebook page. Thanks! Tweeted one last time and keeping my fingers firmly crossed for tomorrow! Winning this would be a dream come true for me and my little ones. Thanks for a great contest. I’m from the States. I have a 6 month old son, which has made me reevaluate the National school systems and look into better ways to educate my child(ren). Thanks for the giveaway offer!